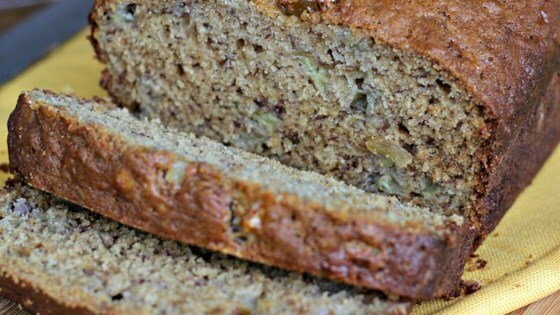 "This is a very moist banana bread with lots of banana flavor. There is a bit of spice for those who like a bit of 'extra' in their banana bread. This recipe still has a big banana flavor with a scrumptious note of spice to make it really special." Combine flour, baking soda, cinnamon, nutmeg, ginger, and salt together in a bowl. Beat butter, white sugar, and brown sugar together in a bowl using an electric mixer until smooth and creamy. Stir bananas, eggs, lemon juice, and vanilla extract into creamed butter mixture until well blended. Stir banana mixture into flour mixture until batter is just combined; pour into the prepared pan. Bake in the preheated oven until a toothpick inserted in the center of the loaf comes out clean, 60 to 65 minutes. Cool bread in the pan for 10 minutes before turning onto a wire rack to cool completely. If you want to bake in a smaller pan, then shorten the baking time to 40 or 45 minutes. If you are using decorative wooden lattice bread pans (common during the holidays for gift-giving) remember to increase the temperature by 25 degrees. To make your mashed bananas, you can either mash them with a fork for that lumpy-bits-of-fruit experience or you can put them into the food processor for a very smooth result. I prefer to mix the lemon juice in with the bananas at this point to keep the fruit from browning while I'm preparing the batter. Remember that bananas increase dramatically in sugar content as they ripen. The more ripe the bananas the sweeter the bread will be. The greener a banana is, the more bite it will give the bread. Find the version that works best for your family. I personally like mine when the bananas have become soft and the skins are speckled with brown spots. Aroma while baking was wonderful. Tasted sweet, with an excellent balance of flavors. Texture was very moist and luscious. I will be making this again. As with most quick breads, this tastes better the day after you make it. I think next time I'll play around with the spice levels a bit. All in all a good bread, though. Eating a slice now. It's really great. I will see what my husband says when he tries it. That's the real test.